All species of Honeysuckle plant (Lonicera) fall into two categories: 1) arching shrubs and 2) twinning bines, with the large majority being climbing plants that make for attractive Honeysuckle vines. These Honeysuckle vines produce trumpet shaped flowers, honey-like scents, and sweet nectar that attract butterflies, hummingbirds, and even humans who enjoy sampling the nectar. This type of vine is quite easy to grow when correctly planted and maintained. 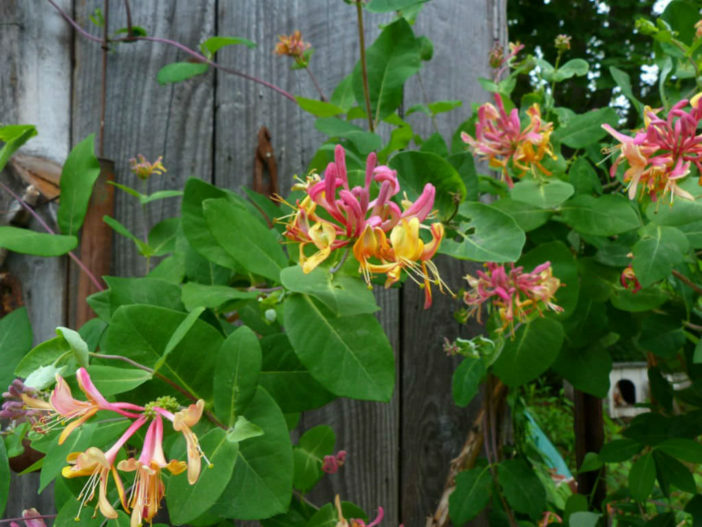 If you find yourself having trouble getting your Honeysuckle vine to thrive, you may be making some of the following mistakes in caring for your plant. These mistakes are common, but fortunately, they are also easily remedied. When the timing is finally right, locate a spot for planting where they’ll get full sun, or at the very least, partial sun exposure. Plant your Honeysuckle at a soil depth of 18 inches (45 cm) and lay an organic fertilizer or compost over the top 3 inches (7.5 cm). This type of vine is sensitive to the amount of water and moisture it receives. When you first plant your Honeysuckle, the plant will need a considerable amount of water to help it grow. However, by the time summer arrives your vine will be more fortified and only need small amounts of water, even during dry spells. Many people make the mistake of continuing to water the plant equally throughout these different stages, which is a definite recipe for harmful overwatering in the summer months. The more important goal isn’t to provide the vine with excess moisture, but rather to retain the modest level of moisture that is proper for flourishing. To retain moisture, mulch the base of the plant heavily. A 2-inch (5 cm) layer of dried leaves, pine needles, or shredded bark makes an ideal mulch for the Honeysuckle vine. At the beginning of the growing season, add a balanced fertilizer (10-10-10) around the base of the plant. Make sure you choose a controlled release variety. In midsummer, fertilize again with a balanced formula liquid fertilizer to encourage continual flower blooms. Be especially careful not to fertilize too much. Many growers don’t realize they’ve made this mistake until it’s too late because things will seem just fine at first. Using too much fertilizer will still cause the foliage to thrive, which will give the initial impression of a successful vine, but the excess fertilizer will negatively impact flowering down the line. Keep the soil pH between 6.1 and 7.8. Allow plants to become well established before pruning. Pruning Honeysuckle too early can either reduce the number of blooms the vine produces or kill the whole plant. Honeysuckle vines should be allowed to grow for two years before pruning. Prune lightly during the growing season to encourage new growth. With light pruning, only remove old and bloomed-out flowers. Older shoots on established plants should be removed during the spring to encourage later flowering. It’s safe to cut the plant back 1/3 for a major pruning. Late February to March are the ideal times to prune most Honeysuckle vines. Honeysuckle vines are prone to powdery mildews and molds. To reduce the chance of these developing on the vine, make sure there is adequate air movement around your plants. Always plant in open air. Most Honeysuckle vines are grown with support systems, although sometimes they’re grown as ground cover for erosion control. If using support systems, it’s important to use them correctly. The trellis or arbor should be in place before planting. This removes the possibility of damaging the plant when trying to install a trellis on an area where a plant is already established. Plant the vine 6 to 12 inches (15 to 30 cm) away from the support to allow enough room for it to grow. Once the vine starts climbing the support system, tie it to the arbor using a strong, stretchy material, like strips of old nylon hosiery. Cross the material between the stem and the support system to prevent the stems from rubbing together.